*Guest post from four-time attendee and Fall 2018 Inspired Retreat speaker, Yasmine Kashefi. Yasmine is a Toronto-based Creative Business Strategist with a passion for getting results and making things happen. After launching a successful corporate consultancy, she refocused her efforts to provide high calibre, comprehensive business guidance to entrepreneurs at Yasmine Kashefi Consulting. Yasmine works with female entrepreneurs to help them scale their business and increase profits, leveraging the same streamlined systems she developed for her 7 to 9 figure clients. When I rolled up to Evins Mill for my first Inspired Retreat in October of 2015, I had no idea that my business was about to change forever. But it did. Inspired Retreat was the first business “conference” I had attended that had a meaningful, tangible impact. I left Inspired Retreat feeling empowered, excited and, most importantly, less alone than ever before as an entrepreneur and business owner. I loved the experience so much that I didn’t hesitate to sign up again when the dates were released for 2016. This time, when I arrived at Evins Mill, it felt like coming home. Inspired was, yet again, a breath of fresh air for my business. The experience helped me sustain momentum and gave me the tools, resources and relationships to scale my business further. Did I mention that between all that transformation work, I also got to attend beautifully designed farm-to-table dinners, sip on tasty drinks at cocktail parties, go on a fun hike and get showered with awesome swag from speakers and Inspired Retreat sponsors? This May, I’m attending my fifth Inspired Retreat, and as a speaker once again! It’s such an honor to pay it forward at the very same place that helped set my business on the path it’s on today! If you’re attending Inspired for the first time it can be exciting, but also a bit nerve-wracking! 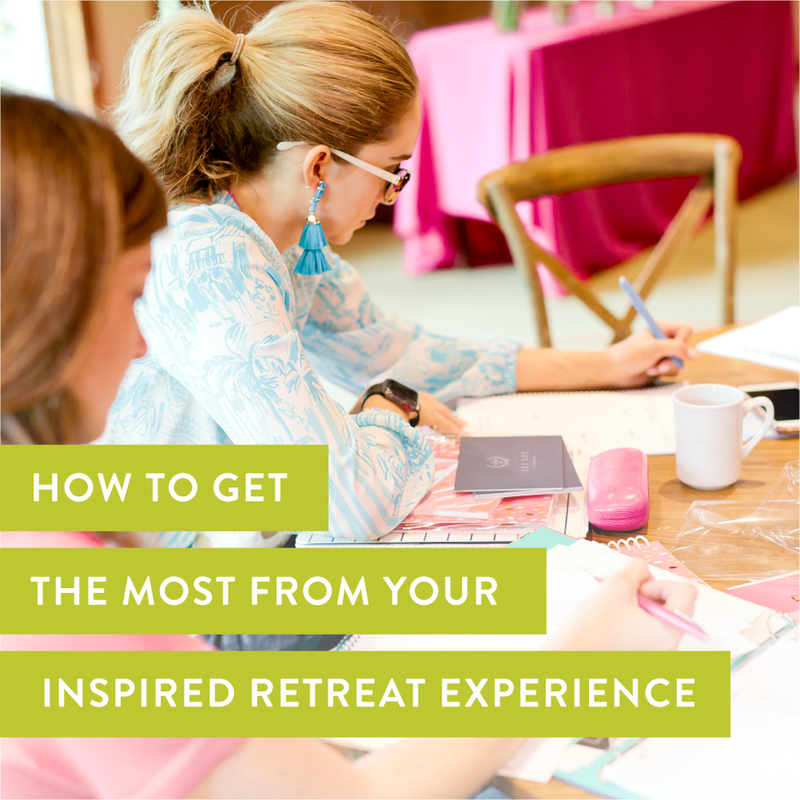 Don’t worry though – I’ll walk you through exactly what I do to prepare for Inspired Retreat every time I attend! This is one of my favorite parts. I’m that entrepreneur stereotype – I live in yoga pants and top buns all day, every day. But attending Inspired reminds me I’m an adult again ;) Amber prepares a color palette and sends to all attendees weeks before Inspired. I love to use her color palette inspiration to shop my closet (and maybe the mall too) for my Inspired wardrobe. Ladies – do NOT miss out on the amazing attendee Facebook Group. Not only is it a great way to get to know the other attendees, make travel plans and more, but the speakers also pop in with some pre-retreat trainings to help you prepare! What are the specific things you want to get out of Inspired? Is there a specific skill you want to learn or a new strategy you want to apply to your business? Are there any attendees or speakers you want to connect with? 4. GO THROUGH BLOOMING BUSINESS KITS! Amber put together a thorough program to give you a strong foundation. For example, if you’re planning on attending the Digital Marketing session with Myrna P. Daramy, then you’ll definitely want to jump into the SEO training in Blooming Business Kits before you go. If you don’t have time to go through all the modules, pick the ones you can easily identify as areas of improvement for your biz! At Inspired, you don’t line up to ask the speakers questions. You sit next to them at dinner and have lovely conversations. There are so many opportunities to connect with experts, so review the list of speakers, and think of any questions you may have for them! You’ll have the chance to ask questions during the sessions, cocktail hours, dinners, and fireside chats. It’s not always as easy as putting on an auto-responder. Let your clients know in advance that you will be away or create a plan with your team to cover your day-to-day duties so you can fully immerse yourself in the experience. Inspired Retreat is a real treat of an experience and you’ll want to enjoy it without having to constantly check your phone. Bring some local flavor! This is by no means required or expected, but as one of the only Canadians attending (usually), I like to bring maple flavored treats to share! Have any other questions on how to prepare for Inspired? Send me a message at @yasminekashefi on Instagram or drop me a note at hello@yasminekashefi.com! I can’t wait to meet you in person in May! Don’t have your ticket yet? What are you waiting for? Save your seat by clicking here. Tickets ALWAYS sell out so you don’t want to delay.